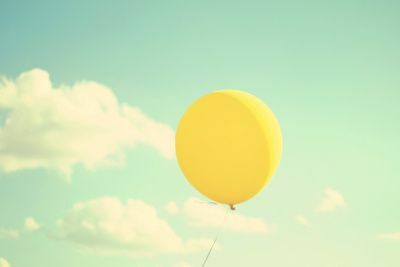 the yellow thing that did not drop if you let go. or grow wings so she could float with him through the air. a length of ribbon, pink and curled, joined the happy pair. When do children learn about unhappy ends? he would choose, if he could, when he must leave his friend? of air that grows heavy with the passing of the year. despite the pain, a quick end he would not refuse. from her hand to climb the infinite sky. Of course he will never really get to choose. But aye, what an end? To finally, truly, fly. from view while you grow cold and evermore alone. If he could choose, would he choose this after all? Unsure, he but grips the only hand he’s ever known. This poem was partially inspired by “Everything is Alive: Episode 1” as well as by the lovely checker at our local grocery store who gave my daughter her first balloon.